Nestled between the ancient Sawtooth Mountains and the beautiful North Shore of Lake Superior combined with the rugged Poplar River carving its way through the course, Superior National pairs untamed beauty with unparalleled play-now enhanced by a $4.5 million renovation. Once rated by Golf Digest as Minnesota`s "Best Places to Play" golf course is now even better! Renowned architect Jeffrey Brauer (Giants Ridge and Wilderness at Fortune Bay) refined the River and Canyon courses with "Ohio`s Best" white sand bunkers, five sets of tees, wider and directing fairways, environmentally and conservative irrigations system and larger more putting friendly greens. It is family friendly and playable for the young, beginning or seasoned golfer to a definite challenge for the scratch player. The River and Mountain courses are in play for the 2017 summer/fall season with the Canyon course nicely greening up from new construction with a hopeful 2017 fall season open. Cascade Vacation Rentals is pleased to offer stay-n-play packages for this outstanding golf course. The picturesque Lake Superior North Shore community of Grand Marais, Minnesota, offers an exciting array of arts events, classes and entertainment to appeal to tourists and residents alike. Whether you are interested in art, writing, theater, folk crafts, culinary arts, music or just relaxing near the beauty of Lake Superior and its surrounding boreal forests, you`ll find an eclectic variety of activities to pique your imagination. The Grand Marais Art Colony is Minnesota`s oldest art colony, formed in 1947. It continues to thrive today hosting workshops and exhibits. This art colony has formed one of the cornerstones of the Grand Marais` arts community. Newly expanded and remodeled, the Grand Portage National Monument is built on the same site as the original fur trading post. This is an excellent place to learn about the history of the Anishinabe or Ojibwe people, the North West Company fur trade and how past events shaped the area you are visiting today. One of the more unique tourist draws in our region, North House Folk School, is one of the only of a handful of such schools in the U.S. North House offers classes on everything from timber-framing to basket making and a hundred other arts and crafts. Click on the link below to see pictures of the beautiful campus and a full list of courses. A beautiful spot with easy hiking trails, an interpretive center and a calendar of events including expert speakers. This is a favorite spot for guests to bring the whole family. Although the Cook County area is known for its rural nature and outdoor recreation, fine dining can be found as well. Some personal favorites include Mogul`s in Lutsen, the Coho Cafe in Tofte, the Crooked Spoon, the Angry Trout and Chez Jude allin Grand Marais. A link to a complete list is below. There are many wonderful places to hike on the North Shore. Perhaps the Superior Hiking Trail is the most well-lovedl. 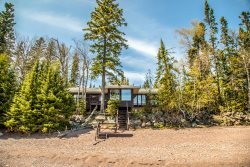 The SHT boasts varied terrain, from river banks to hilly maple woods, interspersed with stunning views of Lake Superior. The trail is divided into sections, some easy, some very challenging. Our favorite is the Oberg Mountain Loop. There are many great opportunities for kayaking on the North Shore. Inland lakes offer a safe environment for paddlers, skill levels ranging from beginner to the accomplished. Sawtooth Outfitters, adjacent to the Cascade Vacation Rentals office in Tofte, has kayaks for rent. Sawtooth offers scheduled tours or basic instructions for heading out on you own. View the link to their website and check out their offerings. There are awesome opportunities for road and mountain biking on the North Shore. From the Gitchi Gami Trail to Pincushion Mountain in Grand Marais and then up the Gunflint Trail outside of Grand Marais. Some of the trails are part of the cross country ski trail network, forest service roads and then there is the paved Gitchi-Gami Trail, with its already completed local 10 mile section. This trail is a true asset to the North Shore and will eventually connect Two Harbors and Grand Marais running through five of the State Parks along the shore. Visit www.ggta.org to become a member and learn more about future construction. Didn`t bring the bikes? Sawtooth Outfitters near the Cascade Vacation Rentals Office in Tofte, has mountain bikes for sale and rent, with suggested routes. View their website for all of your North Shore adventure needs. Set sail on Lake Superior via a 42-foot performance yacht and view the beauty of the shoreline from the water! Experience the basics of sailing or simply enjoy the picturesque scenery. Advanced reservations encouraged. When completed, the Gitchi-Gami State Trail will be an 86 mile non-motorized, paved trail between Two Harbors and Grand Marais. The trail provides visitors and residents with a safe alternative to riding on Highway 61. Various segments of the trail are already completed and can be viewed by visiting the website. Bring your bikes, roller blades, walking and jogging shoes to enjoy this beautiful trail along Lake Superior.